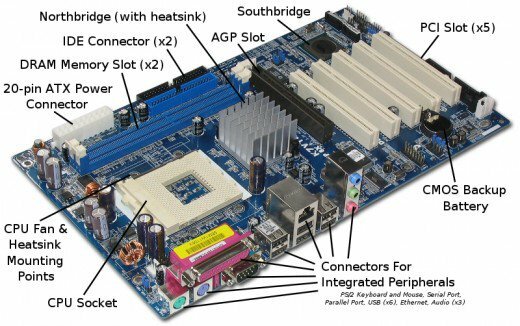 A motherboard is said to be the backbone of a computer. It is a printed circuit board used by many components to communicate and provide different connectors for the Central Processing Unit (CPU), Graphics Processing Unit (GPU), memory, and storage. As you can see the motherboard is an important part of your computer and you need to buy one that will suit your need as well not break down. The following simple tips for amateurs buying a computer motherboard will help you find the right product. You need to make sure the motherboard suits your needs of today as well as work find for needs of the future. This means if your needs are never going to change then find a motherboard that will complete your exact requirements or else it is a better idea to invest in something that can support your future needs. You may be looking forward to build your own PC or may be thinking of upgrading your current PC. The only thing that will remain constant as the foundation of your PC is the motherboard. The following tips for buying a computer motherboard will come handy when you go shopping. Before you decide your motherboard, make sure you know which CPU you are going to invest in. It can either be Intel or AMD. It does not matter if you go in for AMD or Intel as both are the masters of their game, what matters is the motherboard. This is because each CPU requires a different socket and chipset. The AMD CPUs use AM4 sockets and the Intel 8th Gen Core CPUs use the LGA 1151v2 sockets. You don’t need to understand the chipset, but it is important that the motherboard has the right chipset and the correct socket for the CPU you are planning to use. Motherboards are available in different sizes. This helps provide some flexibility when building a PC. The size not just helps define the space they take up but also the number of components they supports. There are three types of motherboards based on size: ATX, Micro-ATX, and the Mini-ITX. The basic idea is large the size of the motherboard, more the number of components it will be able to support. Keep in mind, not all cases will be able to support all the form factors. Thus, you will want to make sure the motherboard and the case match. Apart from CPU, motherboards can connect different components. These include the graphics cards, sound cards, networking cards, storage devices, connections, etc. The standard. The four sizes of PCIe will define the throughput of the connection and size. The four slot sizes include the x1, x4, x8, and x16. The x4 and x16 are the most common sizes. It is important you make sure there are enough slots and they have enough space to fit all your required components. The GPU or graphics card is very important it is what helps in displaying images on your screen. You need to make sure your motherboard can support the GPU as per your intended use. The integrated GPUs with the Intel CPUs as well as AMD CPUs are good for general productivity as well as less-graphic games. However, if you are all out into gaming or video editing, then you need to choose a GPU that helps faster processing. This is where you need to keep in mind the kind of GPU you need to connect to your motherboard and how many GPUs can be supported by the motherboard. RAM or Random Access Memory is the memory where the PC stores information when it is turned on. Most PCs come with 4GB RAM. However, 8GB RAM is great for light users and if you are a heavy user, then go in for 16GB or more. So, where does the motherboard come into picture? Well, the RAM is plugged into the motherboard with the help of a rectangular slot called the dual in-line memory module (DIMM). The number of DIMM slots present in a motherboard help decide how much RAM can be added. Usually there are two to eight slots for RAM. The capacity ranges from 1 GB DIMMs up to 128 DIMMs. You need not worry about 128 DIMMs as it is usually opted for servers. You need storage to store your operating system as well as the data or information on your PC. You need to consider the storage connectors when buying the motherboard. It will include the kind of connections and how many connections you need to add storage. The most common storage connection is ATA, or SATA. You also need to choose between a hard disk drive (HDD) and solid-state drives (SSD). The HDDs are less expensive and offer more storage space, whereas SSDs are expensive with extra speed for copying data. You can choose between SSD and HDD, but remember your motherboard should be able to support your requirements today as well as of the future. Also, remember you may need to attach external storage at times such as pen drives, external hard disk, or memory card, so your motherboard should be able to handle all these requirements. These are some simple tips for amateurs buying a computer motherboard. Choose your motherboard carefully by weighing all your present and future needs as well as the cost factor. If the motherboard fails, then you have no option but to consider buying a new PC at times.